Have you experienced an increase in social media search requests? As attorneys become more likely to turn to social media during their informal discovery processes, I have found an uptick in questions like: “could you please do a social media background check on this person?” This is a growing information need I believe law librarians are excellently suited to fill, and really the next generation of public records search requests. Through conducting these searches and by leaning on the expertise of others I have put together my own toolkit on tricks to use. Below I list methods incorporating Google advanced search terms to conduct searches on Facebook quickly and with high relevancy (Part 2 of this series, where I discuss using advanced searches in Twitter, is available here). Granted, results for social media searches are completely dependent on privacy settings. If a user has set their privacy settings very high, it doesn’t matter what type of tool you use to try to find them, the results will not populate, and the results will not be open to the public. Furthermore, one of the tricks of performing social media searches is to do so while avoiding the ethical problems of being logged into the actual social media service; the tricks listed below do not requiring the searcher to be logged in. Since it is the largest social media site on Earth, and basically synonymous with the term “social media”, I am going to start with Facebook. As far as finding the leader of the free world’s Facebook page, this is the way to do it. 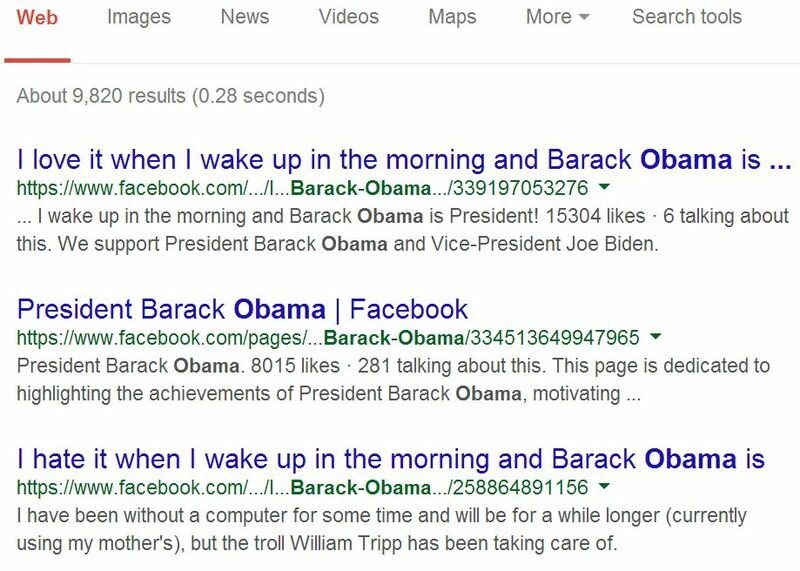 Our 44th President’s Facebook page is at http://www.facebook.com/barackobama, therefore, searching for “inurl:barackobama” leads us right to it. A little luck is involved to have this particular search be successful, it requires the user to have created their custom URL in this format: lastnamefirstname, but, this is a pretty common approach to user’s custom URL creation. Successful social media searching relies, admittedly, on how unique the name is of the person you are searching for. 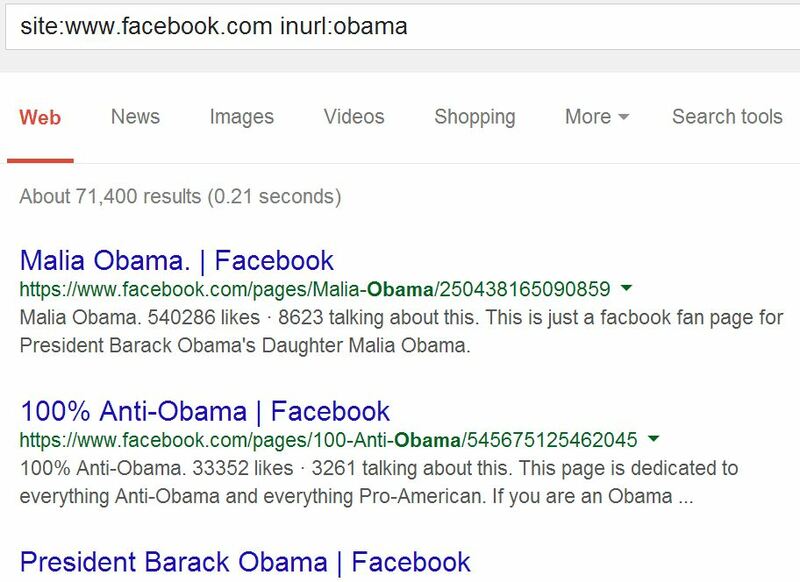 Obama is a pretty unique name, so doing a search for inurl:obama will give us some good results, but, we are led to fan pages and one of Obama’s daughter’s page–the reason being, of course, that the term “Obama” is in the title of these Facebook pages. This search isn’t as good as iteration number one, but, if you’re searching for a person with an extremely unique name, this can get you to your result very quickly. 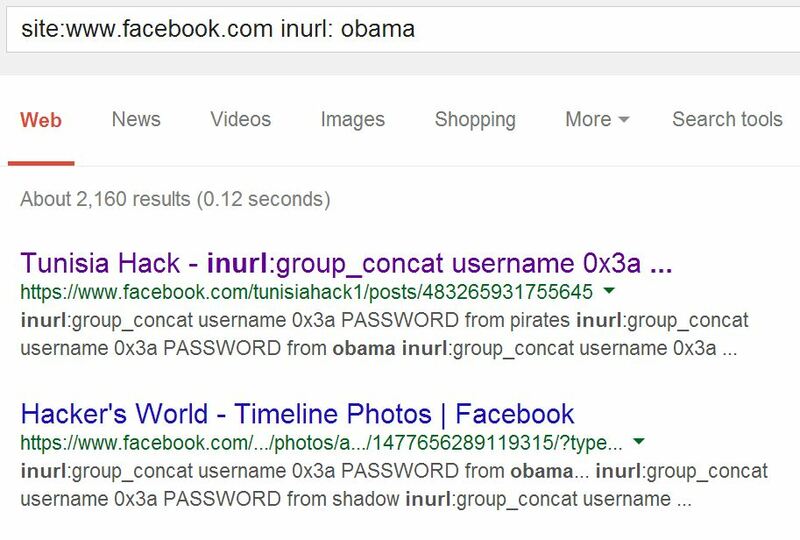 Having that space between inurl: and your terms appears to cause Google to search for instances where “inurl:” and “obama” appear on the same facebook page. With that additional space, inurl: turns from being a search to be conducted inside just the URL of the page, to inurl: being the terms of the search–like you’re googling “inurl:”. Trust me, I’ve unintentionally added that space numerous times–it’s an easy mistake to make. So, rather than tell Google to strictly search inside the URLs of Facebook, you are telling it to search all public content that includes the particular search string you are putting together. 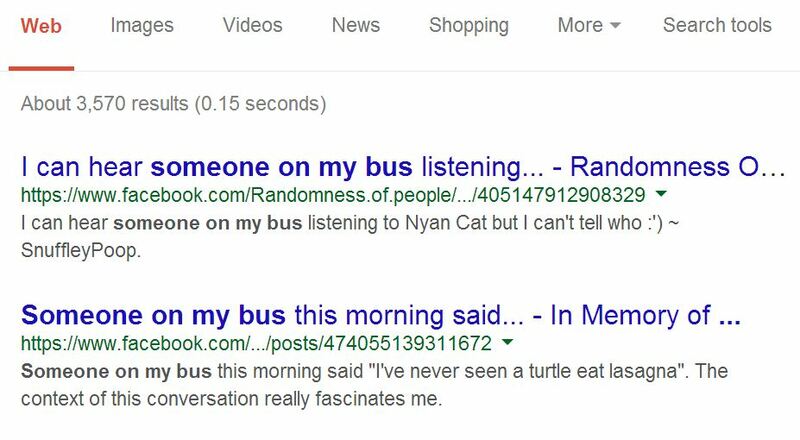 And that would lead you to these particular results, showing “someone on my bus” appearing in various Facebook posts. Again, this can be handy if you are trying to find a trending topic and/or a trending name. So, the inurl: searches are great unless you have a common name, and the “phrase searching” is great if you’re trying to find non-URL text in a Facebook page. You can combine these searches for those cases when you have a person’s name and some other detail about the person, say, a location. In the following search, we are trying to find Obamas that have locations of “Washington, DC”. 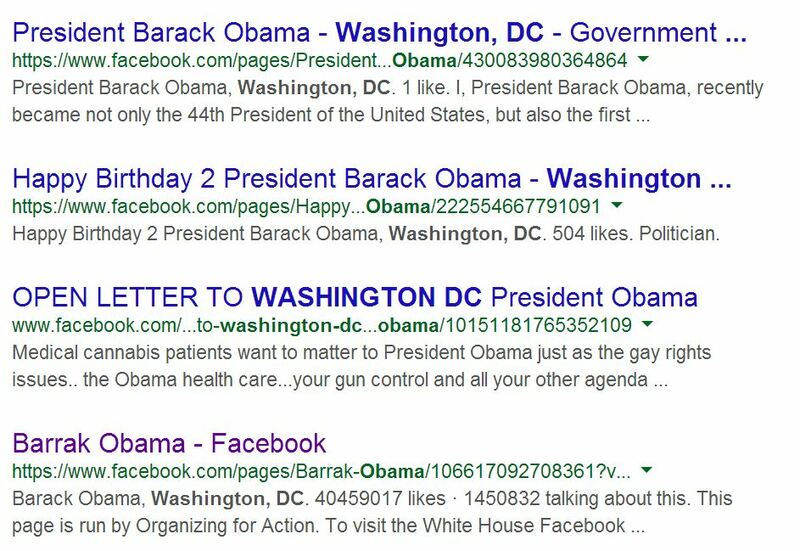 Interestingly, results where “obama” and “washington” and “dc” all appear in the URL will be ranked the highest, followed by results where “obama” is in the URL but “Washington, DC” appears in the text of the page. 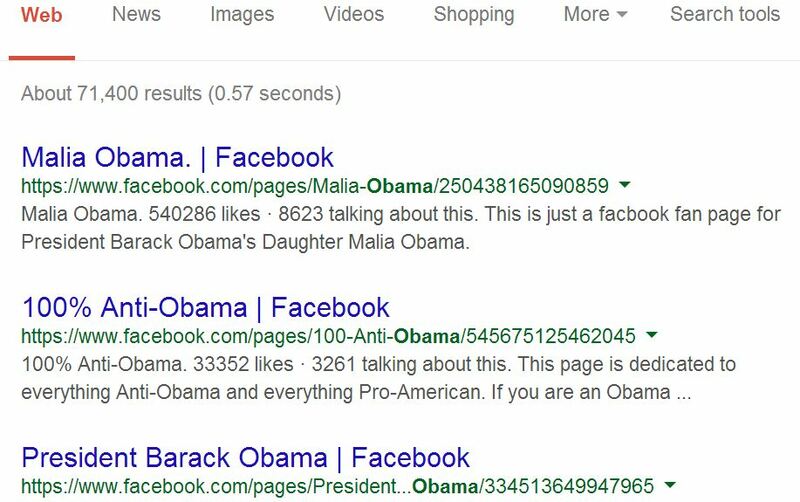 So, the http://www.facebook.com/barackobama page will appear among the results, but it’s actually the sixth result. Regardless, this is a great search when you have a name and a location. Those are my tricks for searching Facebook using Google advanced search terms! Thanks for reading this article, in Part 2: we will look at conducting social media searches in Twitter and LinkedIn! This entry was posted in Tips & Tricks and tagged Barack Obama, Facebook, Google, Google advanced search terms, Googling Facebook, Ian Cleary, inurl:, public records searches, Razor Social, site:, social media searches, www.facebook.com. Bookmark the permalink. Can you send me a copy of part 2 when ready? I want to show my admiration for your kindness in support of those individuals that really need assistance with this important niche. Your personal commitment to passing the message along appears to be astonishingly productive and has truly empowered folks like me to arrive at their targets. Your entire informative guideline indicates a whole lot a person like me and a whole lot more to my peers. With thanks; from each one of us.